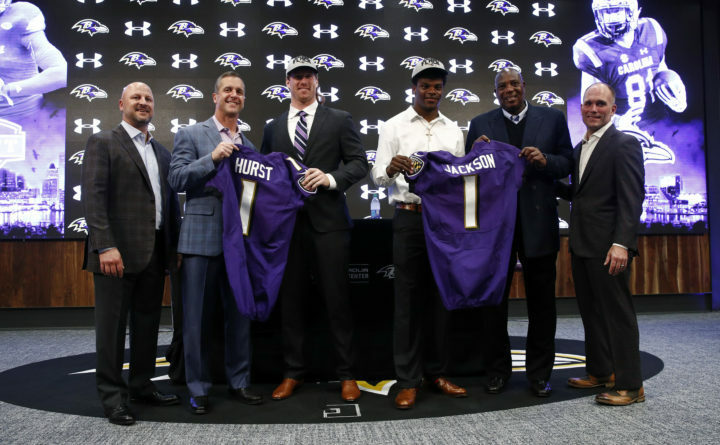 The Baltimore Ravens' first round draft picks, tight end Hayden Hurst, third from left, and quarterback Lamar Jackson, third from right, pose with Ravens director of college scouting Joe Hortiz, from left, head coach John Harbaugh, general manager Ozzie Newsome and assistant general manager Eric DeCosta during an NFL football news conference at the team's headquarters in Owings Mills, Md., Friday, April 27, 2018. DeCosta has been named the next general manager of the Ravens. DeCosta graduated from Colby College in 1993.